Kevin Gilbride's mustache, a legendary lip adornment that won two Super Bowl championships and was respected as one of the most enduring examples of responsible facial hair in sports, died last month in a shaving accident at the Giants' practice facility here. It was believed to be about 41. Gilbride, the offensive coordinator of the Giants since 2007 and a football coach since 1974, confirmed the death in an interview Thursday by pointing to his face. The cause was an inadvertent cutting of half the mustache when Gilbride, 61, was momentarily distracted by something a fellow coach said as he was performing some routine trimming in the days leading up to the Giants' Aug. 24 preseason game with Chicago. Left with part of his lip clean and part of it covered, Gilbride said, there was no option but euthanize the rest of the mustache. "It was difficult," Gilbride said. "But at that point, I had no choice." As you might suspect, the Giants players themselves have been rocked to their very core. "It was just shocking," the Giants backup quarterback David Carr said. "I think it's bigger than if it happened to Tom Selleck, honestly. It had been there so long you almost wondered, like, what's under there?" In the days since, fans have expressed dismay. Representatives from the company Party City even sent a fake white mustache to the Giants as a possible replacement so that Gilbride would not feel uncomfortable, though Gilbride declined to wear it. "When we lost to Dallas, they sent more!" Gilbride said. "Believe me, if I knew that was why we won the Super Bowls, I'd wear them." Gilbride added that his granddaughter, upon seeing him sans mustache, remarked, "Pop, you look weird!" 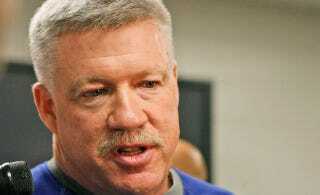 Initially, Gilbride said, his plan was to regrow the mustache from scratch. After several players, including offensive lineman Chris Snee, told him that he looked "5 to 10 years younger now," he is reconsidering. Gilbride's former mustachioed brethren are also dealing with the loss in their own ways. Aaron Perlut, the chairman of the American Mustache Institute, said in an interview that Gilbride's mustache was a perfect example of the so-called Chevron design, which is "your standard-issue, law enforcement-style mustache." Perlut admired Gilbride's consistency, he said, as Gilbride stuck with the same look throughout his career, eschewing styles used by other N.F.L. personalities like "Andy Reid's walrus or Shad Khan's Mario Brothers Handlebar." Perlut added that the institute was saddened to hear of Gilbride's loss but hoped the coach would reconsider his decision to potentially remain hairless around the mouth. "We'd remind Mr. Gilbride that there are religious ramifications," Perlut said. "According to the Dead Sea Scrolls, each time a mustache is shaved an angel falls to Earth from Heaven." For all you Mets fans who also share fan allegiance with the Giants, consider this some much-needed preparation for the impending Keith Hernandez Mustachocalypse, because it is coming and you better be prepared.